Soon there will be a game called David Mitchell Bingo. Kaleidoscopic narrative with multiple interlinked stories? Check. Characters from previous novels? Check. Wit? Check. Metafictional jokes? Check. Invention? Check. Genre leaps? Check. Future dystopia chapter? Check. Intricate plotting? Check. Entertainment? Check. Our interconnectedness? Check, check, check! 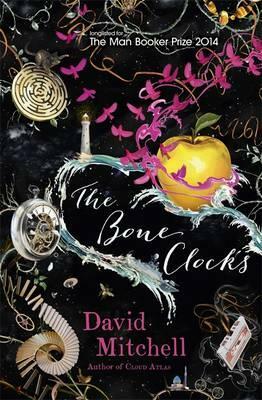 Although of a slightly different ‘flavour’, The Bone Clocks is structurally of the same mould as Ghostwritten and Cloud Atlas. It has six interlinked stories following the life of Holly Sykes, told in first person present tense by five different narrators, two by Holly herself and four by other people in her life. Each chapter is set in a different time period and setting. There’s Holly as a rebellious teen in Gravesend, Kent, in 1984; the deceitful Hugo Lamb in Cambridge University in 1991, who meets Holly in a Swiss ski village; the war-addicted reporter Ed Brubeck in 2004, childhood friend of Holly and now her husband and father to Aoife; the utterly delicious Crispin Hersey, a once successful author intent on taking revenge against his harshest critic in 2015; the Horologist Marinus in 2025 New York City, who in a previous incarnation treated Holly as a girl and now asks her for help; and finally Holly Sykes, living in the post-apocalyptic ‘Endarkenment’ in 2043 on the west coast of Ireland. Threaded throughout is an underlying Science Fiction or Speculative Fantasy plot about a war between the immortal ‘Atemporals’, on one side the (good) ‘Horologists’, on the other: the (evil) ‘Anchorites’. ‘Bone clocks’ is a term given to mere mortals like Holly by the Anchorites. The Horologists are pure immortals, either ‘sojourners’ or ‘returnees’, working to the ‘Script’; while the Anchorites are soul vampires, prolonging their lives by decanting the souls of children, which becomes the Dark Wine they drink every three months in the Chapel of the Dusk to stave off ageing. The Atemporals have all sorts of powers, including telepathy (‘subspeak’); ingressing into, and egressing out of, people’s bodies; freezing people through ‘hiatus’; redacting memories. The Anchorites can also summon the ‘Aperture’, a portal device. The Horologists failed in their ‘First Mission’, an attempt to destroy the Chapel of the Dusk and the Anchorites, and are preparing a second attack. Still with me? There’s no doubting Mitchell’s storytelling ability. His narratives rollick along with three dimensional characters and intricate plotting. It’s all very entertaining. The bad boy of British letters, Crispin Hersey, with his cynical takedowns of other writers and critics at literary festivals, is an absolute scream. Living off the early success of Desiccated Embryos (Dead Babies by Martin Amis?! ), he doesn’t mind referring to himself in the third person. His new novel, Echo Must Die, is ripped apart by critic Richard Cheeseman, who was once a friend in their Cambridge days. Cheeseman could be commenting on The Bone Clocks when he writes: ‘The fantasy subplot clashes so violently with the book’s State of the World pretensions, I cannot bear to look’, and, ‘What surer sign is there that the creative aquifers are dry than a writer creating a writer-character?’ Crispin (and Mitchell?) counters with, ‘in publishing, it’s easier to change your body than it is to switch genre.’ These playful metafictional jokes are great fun. Wadjemup, they called this island. Means the Place Across the Water. … For the Noongar, the land couldn’t be owned. No more than the seasons could be owned, or a year. What the land gave, you shared. … Whitefella ship us to Wadjemup. Chains. Cells. Coldbox. Hotbox. Years. Whips. Work. Worst thing is this: our souls can’t cross the sea. So when the prison boat takes us from Fremantle, our soul’s torn from our body. Sick joke. So when come to Wadjemup, we Noongar we die like flies. What is born must one day die. So says the contract of your life, yes? I am here to tell you, however, that in rare instances this iron clause may be … rewritten. Death and immortality is one of the key themes of The Bone Clocks. It is interesting that the oldest Horologist, now known as Esther Little, otherwise known as Moombaki, is a Noongar woman, who has lived for thousands of years. And the Horologists don’t go across the ‘Last Sea’ where the souls of dead bone clocks end up. It’s a nice echo of the Noongars’ Wadjemup history, and shows Mitchell is a thoughtful writer and plotter. An adjunct of the mortality theme is a predacious theme, with both Anchorites and mortals eating future generations. The final story is set in the post-apocalyptic future, the so-called ‘Endarkenment’. There are electricity, food and medical shortages, ration boxes, security cordons, and the Chinese Pearl Occident Company (POC) rules everything it seems. (There have also been pandemics of ebola, a disturbingly prescient element given current events in West Africa.) When the POC removes support for the Irish ‘Lease Lands’, the jackdaws take over, with lawless chaos and an every-person-for-themselves mentality. The young look at the older generations, like Holly’s, as future eaters. It’s a bleak and terrifying future vision. With Mitchell you’re often left feeling you’re reading several novels in one. That’s certainly true of The Bone Clocks. There are passages that add details that don’t seem necessary, in which you wonder whether he is paying attention to a minor character because he wants to use that character in a future story. More troubling, though, is the lingering question of what it all means. After some thought, I’ve decided there is a serious point here, that of immortality gained through predation, of the rich and privileged eating the future. I enjoyed The Bone Clocks immensely, and I admire Mitchell’s writing. His legion of fans will love it. Fans of Murakami and China Mieville will love it, too. Nevertheless, when the next Mitchell novel comes out, I’ll do what I did this time: run to the book store and rub my hands with glee at the expectation of the reading experience to come. I know it will be entertaining. And I’ll find out whether my David Mitchell Bingo idea has any legs or whether he surprises with something new. There are plenty of Mitchell believers out there. Ursula Le Guin praised The Bone Clocks at the Guardian here. Carolyn Kellogg loved it at the LA Times here. Cloud atlas is a mesmeric creation. I was tempted to say I’ve never read anything like it, before Calvino’s equally beguiling If on a winter’s night a traveller came to mind. It is made up of six interlocking, nested narratives, each written in a different style in different historical (or future) time periods. Mitchell’s core ethos as a writer is that everything is connected. This was beautifully rendered in his debut novel Ghostwritten (see my review), which also featured interlocking stories. His belief also manifests in the highly entertaining way in which he uses characters in multiple books; (for instance, an eighteenth century ship captain by the name of Molyneux, who appears in one of the six strands in Cloud Atlas also appears in his latest work, The thousand autumns of Jacob de Zoet (see my review); and there are others). What makes Cloud atlas different to Ghostwritten are the different narrative styles, the different time periods and the pyramidal structure, with each story read or viewed by the main character in the following story. We read the first half of the first story, (‘1a’), then the first half of the next (‘2a’), and so on until the middle story, after which we fall down the other side of the pyramid. The full structure is: 1a; 2a; 3a; 4a; 5a; 6; 5b; 4b; 3b; 2b; 1b. We end where we started, reading the journal of a mid-eighteenth century clerk. Adam Ewing is an American sailing through the South Pacific on board Prophetess, heading for Hawaii and then his home in the gold-rush boom city of San Francisco. After observing the violent clashes between Moriori and Maori peoples in the Chatam islands, he is diagnosed with a brain parasite. He is treated by his friend, the ship’s surgeon Dr Goose, but there is a good chance the treatment will kill him. The journal is cut-off mid-sentence and we are plunged into the second story, of impulsive, down-and out musician Robert Frobisher, who is writing letters to his friend ex-lover Sixsmith from Belgium in 1931. The caddish Frobisher finds work as an assistant to retired and ill composer Vyvyan Ayres. Frobisher is a wonderful character, passionate, wild, sniping. He beds Ayres’s wife. Meanwhile, he writes that he found and read the first half of Ewing’s journal. Like us, he’s frustrated that he’s only got the first half of Ewing’s story and pleads with Sixsmith to help him find the second half, writing, “A half-read book is a half-finished love affair.” (How true!) He is also tickled that poor Ewing doesn’t realise that he’s being poisoned by Dr Goose! The third strand, set in mid-1970s California, features Sixsmith as one protagonist in the corporate crime thriller entitled ‘Half Lives: The First Louisa Rey Mystery’. The half-lives refers to the fact that Sixsmith is a nuclear scientist working on developing a new type of reactor for civilian power generation, but is also a playful nod to the fact we are getting these half-stories. Enter investigative reporter Lousia Rey, who is looking for her Watergate scoop and stumbles onto a design fault in the new reactors that could threaten catastrophic meltdown. Of course, the ‘powers that be’ so-to-speak will do anything to prevent this news leaking. We are led to a thrilling climax as Louisa escapes with Sixsmith’s report that shows the design fault, before we are again cut-off. Timothy Cavendish is an unsuccessful publisher in modern-day London. His story, written as a highly entertaining comic farce, sees him publish a spectacular hit penned by a jailed hitman. All the profits have gone to pay off old debts. The hitman feels he’s getting a raw deal on royalties and sends his brothers to rough up Cavendish. There’s lots of fun had here, including a spectacular end for a literary critic (I better watch what I say!). When Cavendish’s brother refuses to help him with a loan to pay off the hitman, Cavendish says: ‘We’re brothers! Don’t you have a conscience?’, to which his brother replies: ‘I sat on the board of a merchant bank for thirty years.’ The farce escalates when the brother offers Cavendish asylum in a safe house up near Hull, which turns out to be more asylum than safe-house. Cavendish is trapped in a Kafka-esque nightmare, without hope of escape. Somewhere along the way Cavendish started to read the unpublished manuscript entitled ‘Half Lives: the First Louisa Mey Mystery’ by Hilary V Hush, which doesn’t particularly grab him. Set in the future corpocracy of Neo So Copros in Korea after the ‘Skirmishes’, the fifth story, written as dystopian sci-fi, focusses on the fabricant (clone) restaurant server Sonmi~451. She is being interviewed by an ‘Archivist’ after committing some form of crime. The record of the interview is recorded by an orison and will be held in the Ministry of Testaments. Fabricants exist to serve ‘purebloods’. Sonmi~451 works as a slave in Papa Song’s fast-food dinery, a place where breaks are considered ‘time theft’. There’s lots of sci-fi inventiveness and wordplay here, with terms such as fabricant, doodlemoos, peakjammed, wombtank, upstrata and birth quotas all appearing in one sample half-page. There’s also intelligent changes in the spelling of words: our ‘explain’ becomes the future’s ‘xplain’, and so on. What sets Sonmi~451 apart is her ability to ‘ascend’, or become self-aware. Soon representatives from an underground rebel Union movement free her. Just as she is enjoying watching a movie entitled ‘The Ghastly Ordeal of Timothy Cavendish’, the corpocracy cops find her. She attempts to flee but we are, again, cut off! The sixth and middle story is set on the big island of Hawaii even further into the future, after the so-called ‘Fall’. It’s narrated in first person by an old man named Zachary, who looks back on tumultuous events from his childhood. Zachary lives in a primitive society of Valleysmen, for whom Sonmi is a God. Their enemy is the Kona, a blood-thirsty rival tribe. The big island is visited occasionally by people called ‘the Prescients’, who have advanced technology. Prescients live to be 60 or 70, a number which shocks the Valleysmen who struggle to live much beyond 40 because of ‘redsoak’ or ‘mukelung’. A Prescient woman, the aptly named Meronym, comes to live with Zachary and his family for a few months. After a time she reveals her purpose of the stay, she needs a guide to take her up the volcanic mountain Mauna Kea, a place the Valleysmen fear to go. Zachery is mistrustful of Meronym and goes through her possessions, finding the orison of Sonmi. Meronym explains to him that Sonmi is not a God, but a person who lived before the Fall. Zachery agrees to take Merynym up the mountain. First, second, third days the Prescient woman was wormyin’ into my dwellin’. Got to ‘fess she din’t b’have like no queeny-bee, nay, she never lazed a beat. She helped Sussy with dairyin’ an’ Ma with twinnin’n’spinnin’ an’ Jonas took her bird-eggin’ an’ she list’ned to Catkin’s yippin’bout school’ry, an’ she fetched water’n’chopped wood an’ she was a quicksome learner. We then follow the second-halves of the first five stories. What are we left with? As Zachary observes: ‘Souls cross ages like clouds cross skies.’ The stories are linked by the repeating soul, with several characters sharing the same comet-like birthmark. Other links come in the form of words: six is used repeatedly. There are six stories. There is Sixsmith, who is 66 years old. Cavendish is sixty-something. There is Frobisher’s Cloud Atlas sextet. Zachary is sixteen when Meronym visits. There are more examples besides. The main thematic thrust exists in the numerous rises and falls of characters, peoples, societies. As readers, we rise and fall too, up the pyramid of stories and then down the other side. The aptly named Adam Ewing, our first man if you will, rises up a mountain in the Chatam Islands, then falls into it. Sixsmith lets himself out of an upper-storey hotel window to avoid paying the bill. Louisa Rey’s car is forced off a bridge and falls into the water below. The literary critic in Timothy Cavendish’s story is tossed off the roof of a building! Sonmi~451 ‘ascends’. Zachary (our ‘Z’ and final man) and Meronym climb and descend a mountain. Moreover, we have the ongoing struggles of one peoples over another. Ewing observes many instances of colonialism’s barbarity. Louisa is placed in peril at the hands of the powerful corporation, as is Sonmi~451. Cavendish is placed into an old people’s home at the hands of his brother, a place where the patients are treated appallingly. The rivalries in the post-apocalyptic world are clear-cut too. There is a chink of light in the final sentences, but overall it’s a bleak world view, something that was also apparent in Ghostwritten. When Zachary asks Meronym who triggered the Fall, she replies ‘[Humans] tripped their own Fall.’ And what of that chink of light at the end? Is it real, is it like the final note of Frobosher’s Cloud Atlas, in which a violin hits a perfectly discordant note? The author writing to his audience about his own doubt about whether it will work. I love this sort of cleverness. There is more of it, but it’s never more obvious than this. When Frobisher writes to Sixsmith of how: “One may transcend any convention, of only one can first conceive of doing so”, we are mindful not only of Mitchell’s upending of the novel’s conventional structure but of a deeper desire: of upending human nature. Cloud Atlas is an amazing read. How appropriate that Mitchell, a believer in interconnectedness, should connect disparate genres and periods in creating his masterwork. 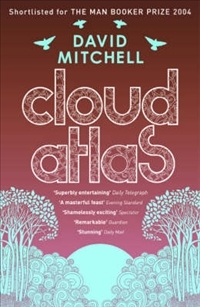 Cloud atlas was shortlisted for the Booker Prize, losing out to Alan Hollinghurst’s The line of beauty. Mitchell considered it unfilmable but, not to be deterred, the makers of the Matrix trilogy have adapted it for the big screen, with Tom Hanks, Halle Berry, Jim Broadbent and Hugo Weaving among others. It will be released in Australia in the new year. Click here for more. First and foremost, I have to doff my hat to the cover art of this book. It is a wonderful design and the iridescent aqua that shimmers as you move the book in your hands is very alluring. Full marks. Jacob is a straight-laced nephew of a minister out to prove his worth to his father-in-law-to-be, so that on his return from the Far East he can marry Anna. He quickly realises he is in a viper’s nest in the small island, named Dejima, that the company trades from in Nagasaki, surrounded by unscrupulous men from all corners, all of whom are on the make. Foreigners must stay on the island and are forbidden to learn Japanese or smuggle any religious iconography into Japan. In the early pages, Mitchell creates a very interesting foundation for the story – the intersection of cultures and religious viewpoints in changing times, with liberal dashes of humour. Dejima is full of suspicious traders, translators, strange customs, spies and forbidden love. Soon after landing, Jacob finds Orito, a Japanese woman with a burn scar on her cheek, who is learning midwifery from a Dutch doctor. He is instantly attracted to her. But she is unattainable. Relationships with Japanese women are forbidden. The first third of the novel sets up this relationship well. Jacob frets over his fiancé in Holland, whilst secretly wondering how to show his favour to a woman her cannot have. He paints her picture on a fan she leaves behind in a ware house and gets the fan back to her. Even this small act is policed, and it is only when the women tells an officer that, ‘yes, it is my fan’, does the officer not bother to inspect it. If he had, both of them would have been in a world of trouble. A dictionary is Jacob’s next gift. Early on, there are wonderful sprinkles of humour too. In describing one of the dismissed company chief’s presence at the local brothel on the night one of the trading whare houses burns to the ground and the mystery of where the fire engine was that night, one of the men wonder whether the chief (p11) had taken “the engine to … impress the ladies with the size of his hose”. And this: (p25) “No need for contracts or such stuff: a gentleman’ll not break his word. Until later ….” The wonderful ‘until later’ is said as a goodbye, but in this world of nefarious dealings and untrustworthy colleagues it serves as an ironic warning also. The book is dotted with pictures to aid out view of the action. Dejima is drawn for us, and we get to see Jacob’s drawings of Orito. The handful of pictures adds to our understanding of this environment. 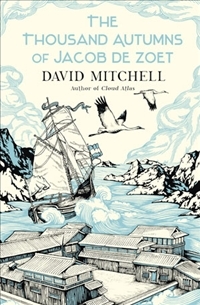 There are wonderfully drawn characters, from the wary, powerful, and inaccessible Japanese, to the rough and ready men of the company – including Dutch doctors, Prussians, Irish and English rogues — and a gout suffering captain of the English frigate Phoebus that surprises both the Dutch and Japanese when it sails into Nagasaki harbour later in the story. But, but, but: after the promising beginning, we have a rather indulgent middle section — which deals with the fate of Orito after the Powerful Japanese Magistrate Lord Enamoto moves against her after the death of her father, and the efforts on the part of one of the Japanese interpreters, Ogawa Uzaemon, to save her. This section reads more like a literary hostage story and is quite at odds with the earlier section. We are taken out of Dejima and Jacob’s world and though we want to know how Orito’s terrible fate is settled, Jacob does not feature and it suffers for it. The Thousand Autumns was long-listed for this year’s Booker Prize but did not make it through to the short list. It doesn’t quite reach the heights of his earlier novels Ghostwritten and Cloud Atlas — and, moreover, doesn’t match Carey’s Parrot and Olivier in America which did make it through to the shortlist. That said, I liked the ending of The Thousand Autumns and am looking forward to Mitchell’s next work and a nod from the Booker judges. Source: The Bookshelf Rainbow, (aka: Personal Library).